Using steel beams mostly steel I beam to support concrete over metal deck when constructing suspended slab over garages is the fastest. This is especially true in areas where steel I beam prices are competitive and that most of the structural steel sizes are available. In the US, steel i beam prices are based on weights though some steel suppliers use the cost per pounds and come up with cost per foot. For high strength sections or structural steel tube, square tubes, rectangular tubes, and circular tubes, are all priced based on length. The availability of section properties of these structural steel sizes make calculation of cost per pound or vise versa very simple. Structural steel can be ordered from steel mills in lengths between 30 feet and 65 feet with 5 feet increment. Other factors that affect steel length are available method of transportation and the weight of steel. For example, an 800 pound per foot section 30 feet long weighs 24,000. If the weight limit for transportation is 20,000 pounds the section will have to be cut and reattach on site. Same thing with length if the section needed is 60 feet long but method of transportation only allow 40 feet, the section had to be cut. One of the reasons why steel detailing services are extremely critical in the steel industry is cost. A good steel detailer will provide list of material needed to complete the project. From that list, the steel fabricator or contractor will make the order usually from steel warehouse. 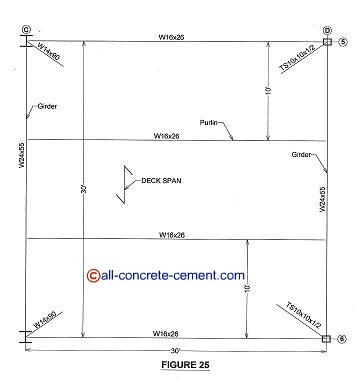 The above figure 25 shows an example of structural steel framing for a 30 feet x 30 feet bay. The W24x55 is the beam designation, W stands for wide flange(or i beam) 24 inches deep, 55 pounds per foot. The smaller beams W16x26 are called purlins and their purpose is to support the metal decks. They are being spaced at 10 feet center to center, the maximum span for the deck. These W16 are framed into the girders, the W24 which transfer the load to the columns. Notice the direction of deck spans must be perpendicular to the purlins.